Ages 10 through 17. Students with language-learning disabilities often have difficulty using language appropriately in various social contexts. The pragmatic language activities in this book are designed to help students use language effectively when faced with difficult situations. Issues relating to the feelings of individuals with disabilities are presented in some of the activities to increase students' sensitivity to the needs of these individuals. Each of the 72 short stories in the second edition is presented on a reproducible worksheet. Activities for Functional Communication Development. The activities in this section are designed to facilitate the development of effective strategies for social interaction. The lessons provide students with opportunities to practice using language to give explanations, to express disagreement, to show disappointment, and for various other purposes. Role-playing situations are included. Stories for Problem-Solving and Communication Practice. This section includes 72 short stories that may be read by the student or presented orally by the instructor. The questions that follow the stories require students to react to the situations described and to offer solutions. 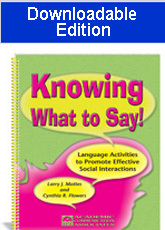 The stories provide meaningful contexts for the discussion of strategies for using language to solve problems that occur during everyday social interactions. Problem-solving topics are included related to issues such as dealing with social rejection, expressing disapproval, sharing criticism, and taking an appropriate course of action. Note: This product is also available in a printed book format. See the RELATED PRODUCTS link below.